Departure at 9 a.m. from Santa Elena to the north into the National Park Canaima. First stop at Jasper Creek, there a 15 min. walk to the waterfall with the beautiful red stones hidden in the jungle. Then we go to the Yuruani waterfall and to the Indian village San Francisco (lunch, handicraft and look around). Now its time to swim and relax in the Balneario Saro Wapo and afterwards we visit Quebrada Pacheco where you can find different kinds of carnivore plants. After this we drive on to the mystic viewpoint “El Oso”, a very special place for the natives, and to the impressing 55m high waterfall Kama. Then we go to the Camp Rápidos de Kamoirán where we’ll have our dinner and overnight stay. After the breakfast we turn into a dirt road towards the indian village Liwo Riwo. There we take a curiara (Indian motorboat) to the 106 m high waterfall Aponwao and walk to a small hidden romantic pool. Back in the Indian village we’ll take lunch and continue to Kavanayen, which is situated paradisiacal on a small hill and surrounded by table mountains. On the way we will stop at the viewpoint “Devil’s Curve”. Visit of the capuchin mission, founded in 1943, dinner and overnight stay in Kavanayen. We start after the breakfast returning to the main road for a side trip to the waterfall Kawi to have a refreshing bath. Then we will take our lunch and to cap the tour off we will visit the outlying Agua Fría. Arriving there, we will climb down a small hill to the pool and follow the river until we reach the “Heavens Door”, where the water falls down and we can enjoy a fantastic view. Unfortunately its time to ride back to Santa Elena de Uairén. My name is Gerhard Maecht and I am 49 years old. 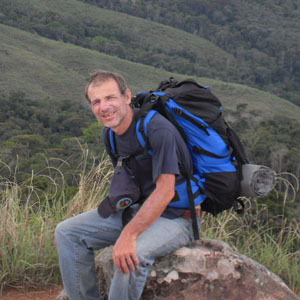 I'm living since 15 years in the Gran Sabana in the south of Venezuela, where I organize tours and also working as a tour guide.